George Washington Carver sitting with other professors at Tuskegee in 1904. One of the weekly standby dishes easily found in Louisiana cooking is dirty rice. A boxed version of dirty rice located the grocery shelves offers a popular version of the dish, “just add ground meat” and you have a great family meal. There is nothing grand about the history of the dish though and today’s recipes for the dish are a far cry from its origins – thankfully. Dirty Rice was a poor family’s cooking. While the slaughtered chicken went into the stew pot up in the plantation house, the slaves or the tenant farmers were left with the chicken guts, even the chicken feet. The Louisiana plantations planted rice in the bayou where it grew plentiful and cheap for the locals. The original dirty rice was cooked chicken guts, the gizzard, heart, and kidneys, cooked in a pan. Afterward the cooked organ meats were chopped fine while the rice cooked in added water in the same pan. The two ingredients were seasoned with salt and pepper before serving. Dirty rice tastes good but the appeal loses some of its luster when considering what was being served in the better houses. For the poor of Louisiana, Black, White and Cajun, dirty rice was a filling staple dish. The dish required local ingredients only and provided stomach filling satisfaction. As a family gained more wherewithal, they kept dirty rice but added more ingredients. Andouille sausage was ground pig stomachs and spices, yet, cheaper than cuts of pork but more expensive than chicken guts. The sausage was added to the pot of rice. Vegetables came and went as they became available and then disappeared with the seasons. Dirty Rice has not changed. Organ meats are still the least expensive items in the meat case. Ground beef and ground chicken are more expensive but adding more rice to the dish stretches out how many mouths one dish can feed, so penny-pinchers can still indulge. Of course, one can sauté vegetables and fold them in, or add hot sauce for an added flavor burst. The dish continues to be trash cooking at its finest, perfect for wilting greens and forgotten items in the back of the refrigerator that are still usable if cooked. Just as an aside, after swapping out the organ meats for sausage, chicken meat and vegetables, the dish is called jambalaya. Add some chili powder for a kick if you want. Dirty Rice is presented as “authentic Louisiana” cooking, a dish that every visitor to the state should seek out and savor. For tourist dollars, one can taste the echo of poverty. Everyone should and while sampling the food, a person should also appreciate the ingenuity and skills of these poor communities that turned the least desirable ingredients into a specialty. Sauté the meat in a heavy pan (like cast iron) until browned. Remove and set aside, leaving the grease in the pan. Add rice and water, cooking 15 minutes or so until rice is soft. Return meat to pan. Season with salt and pepper to serve. Yes, you left your phone plugged into the charger on the counter. On the other hand, your phone is now fully charged. Great lot of good that does me!! Will call later about when leaving and to arrange pick up but no way to notify if I have any problems. Not good. You are going through withdrawal. Your thumbs will twitch and your forehead will break out in sweat as generalized anxiety from the absence of digital stimuli sets in. Use medication and attempt human interaction to fill this acute void. There once was a powerful Japanese emperor who needed a new chief samurai. So he sent out a declaration throughout the entire known world that he was searching for a chief. A year passed, and only three people applied for the very demanding position: a Japanese samurai, a Chinese samurai, and a Jewish samurai. The emperor asked the Japanese samurai to come in and demonstrate why he should be the chief samurai. The Japanese samurai opened a matchbox, and out popped a bumblebee. Whoosh! went his sword. The bumblebee dropped dead, chopped in half. The emperor exclaimed, “That is very impressive! “The emperor then issued the same challenge to the Chinese samurai, to come in and demonstrate why he should be chosen. The Chinese samurai also opened a matchbox and out buzzed a fly. Whoosh, whoosh, whoosh, whoosh! The fly dropped dead, chopped into four small pieces. The emperor exclaimed, “That is very impressive!” Now the emperor turned to the Jewish samurai, and asked him to demonstrate why he should be the chief samurai. The Jewish Samurai opened a matchbox, and out flew a gnat. His flashing sword went Whoosh! But the gnat was still alive and flying around. Point #1 – No other group, including the emperor, was denigrated in order to generate the humor. Historically, Jewish humor has been sensitive to the inferior position of Jews in a given culture and has striven to be uplifting rather than degrading of others. However, Jewish humor is often self-denigrating. Point #2 – There is a wonderful ambiguity between taking the joke at its plain meaning or as an act of unbridled chutzpah. When in doubt, the holy grail (ahem) of the Jewish comedian is chutzpah. It is true Jewish mothers feed their children chutzpah in their breast milk. Point #3 – There never was nor is such a thing as Jewish samurai, at least as of today. Once in a while, a learned student will step back from his/her life and work to create an accessible lesson of what they have learned. Wine and cheese are wonderful treats but few of us have time or the ability to pair the two to enjoy the most out of both. Bon Apetit! 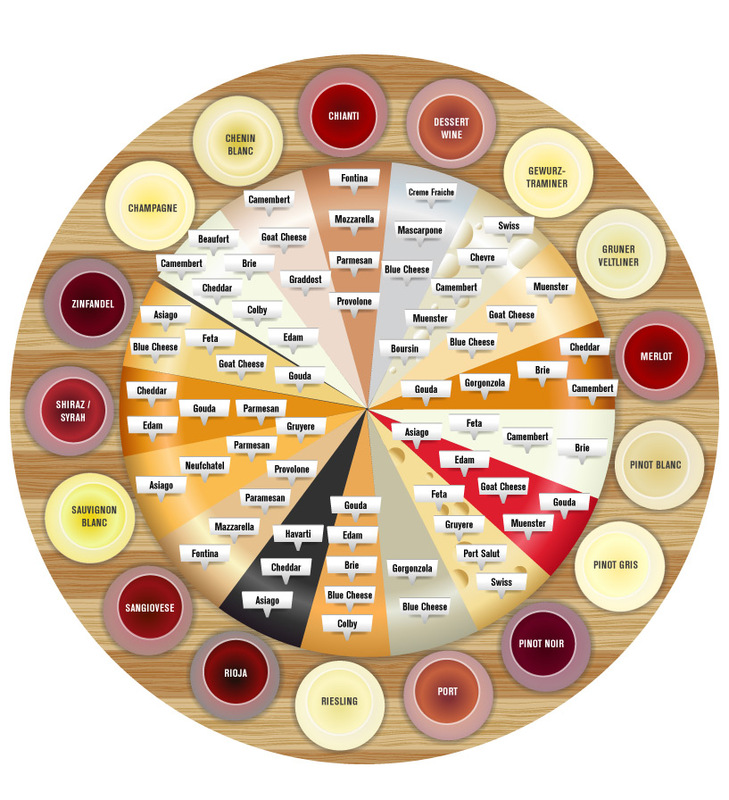 When you are done enjoying this visually rich chart on the pairing of cheese and wine, step back and consider how this teacher chose to present the subject. Most of us would have been content with a spreadsheet or even an how-to booklet. I count at least four or five chapters of a book in this chart yet in this case, the making of a book is unnecessary. How often to do we fail to recognize the genius of teaching subject matter? The most stolen books according to Publisher’s Weekly is by author rather than by title. Literate thieves love everything Charles Burkowski wrote. The most stolen text, amassed by comparing a number of lists is the Bible. The book that states twice, first in Exodus 20 and again in Deuteronomy 5, “You shall not steal” is shoplifted more than most other choices in the bookstore. The irony is not that any person in America can get a Bible for free, a tradition most widespread by the Gideon Society but probably accommodated graciously by any church with a front door. Even the prison will give an inmate a copy of the Bible in Solitary Confinement. The irony is The Bible does not contain the answers these thieves are seeking. Excuse me, the Bible does not contain “The Answers” that the desperate are seeking. People who believe and people who do not believe read the Bible and find all sorts of knowledge: folk beliefs, anthropology, philosophy, theology, history, songs, poems, wisdom sayings and ancient oracles. There may be only one God but the Bible gives us an array of ideas of how one might perceive God, from the All-knowing God of Genesis 1 to the God who exists but the human cannot fathom in Job 38. The most depressing point of a stolen Bible is that the text is incomprehensible without a teacher. A theologian is going to read the text with a certain bias while a biblical scholar is going to teach the text using the tools of Literary Criticism. Answers: the Bible is best understood as generating questions, big ones about life and it meaning to small ones about the definition of word. The Bible is the product of a process and the study of the Bible is a process as well. One should seek out the text to find the questions; to find the answers, find a teacher.